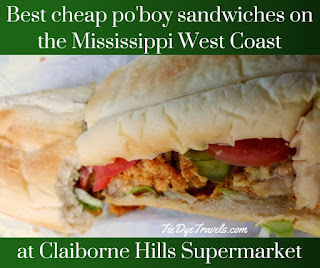 Best Po'Boy Bargains on the Mississippi West Coast are at Claiborne Hills Supermarket in Waveland. Everyone likes a good deal, right? So here's one for you, next time you're in the Waveland-Bay St. Louis area of coastal Mississippi. 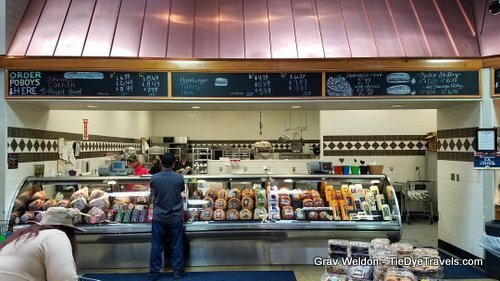 To say the least, we were quite impressed with Claiborne Hills Supermarket - especially after perusing the po'boys on the menu at so many other local establishments. 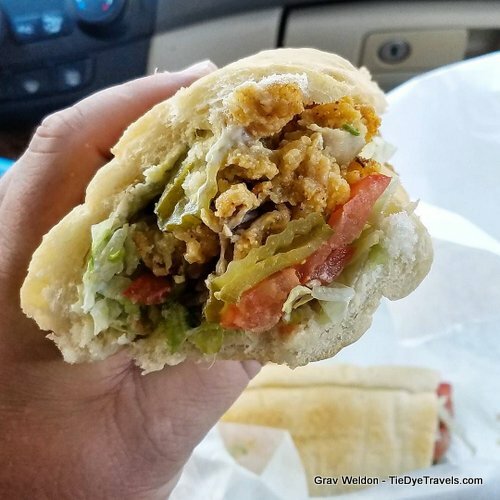 I love a good po'boy, but I am also quite cognizant that there are no true po'boys north of I-20 (and many would say, I-10). There's something about the water, the atmosphere, the people and the bread itself when you get into southern Louisiana and Mississippi that has the right texture and spongy nature to truly fit the sandwich. I've talked about John Gendusa Bakery before in New Orleans, and they make a marvelous product. 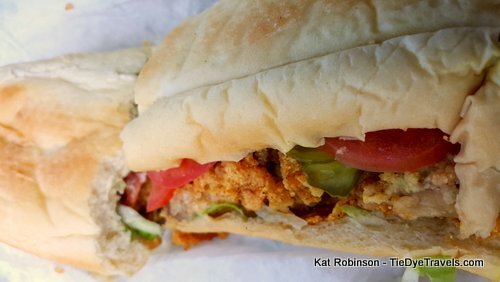 I do have to say, though, if you are along the Mississippi West Coast, there are a variety of po'boy offerings worthy of your consideration (we'll get onto the fantastical roast beef po'boy at the Lunch Box, shortly). And we were hoping to try so many. But wow, prices. 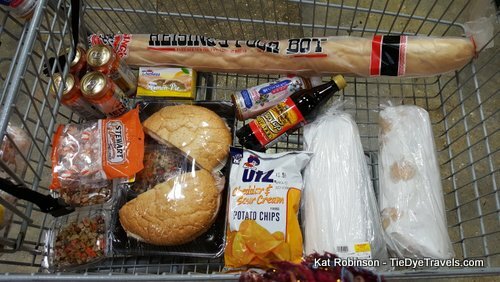 I'll also say we weren't meaning to get about into grocery store po'boys at all. But we were on vacation (hah!) and had no intention of writing about jack or diddly. This was just for me and Grav, and we were sharing this $75-for-two-nights-AirBNB (get an AirBNB travel credit!) on our budget trp where we'd planned to do nothing more than get sand in our shoes. And since our AirBNB had a stove and a fridge we were provisioning up. I was tying my shoe. No joke. That's how we discovered this place... in between me dancing about because I could get my satsuma Swamp Pop (hadn't had any since that SFA New Orleans field trip) and choosing a goat cheese and fig pizza for my own supermarket treat, we'd stared up at the chalkboards above the deli and marveled at the vast array of po'boys offered - cheap cheap cheap. We almost went that way the first night, but Grav had fixated on a muffaletta and I wanted that pizza. So we agreed we'd come back for po'boys before we went home. Two days later, our last act before leaving the area (including a visit to the Waveland Katrina Hurricane Museum) was to drop by and pick up all the things we wanted to take home with us. This included Duchess lemon pies (Grav loves lemon fried pies), olive salad, a po'boy loaf, a couple of frozen muffelatta loaves, and even more. Now, mind you, a few days earlier we'd dined at Shaggy's on the harbor at Pass Christian, where Grav had gone nuts over the size of the oysters, proclaiming it better than ACME in New Orleans and as good as any he'd had off the Atlantic while he'd been at the Savannah College of Art and Design back in his undergraduate years. These oysters, though - he went on and on and on about the supple chew, the perfect batter, the ample loading of his po'boy with all these oysters. More than that - since I have a frightening issue with bloating and cornmeal right now (hopefully we'll figure that one out soon) - Grav was being super sensitive about what I consumed, and asked about non-cornmeal battered seafood for a po'boy for me. 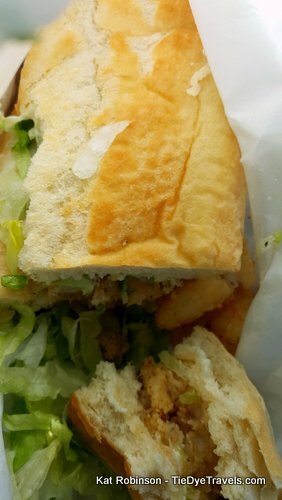 He bounced about when the deli folks gladly offered to fry up a mess of shrimp for a footlong po'boy just for me, with just flour and spices. I was indeed grateful. And that po'boy. Dadgum. 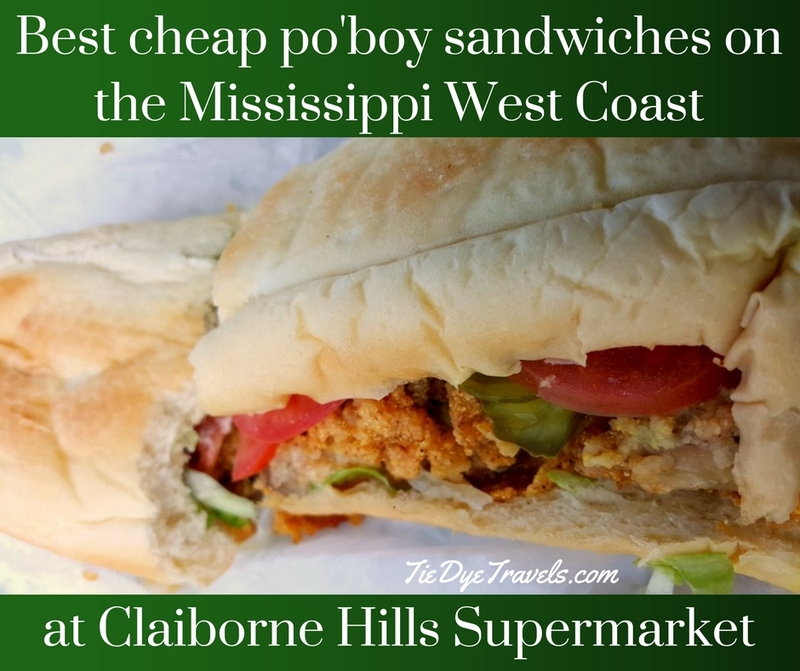 The po'boy loaves are baked in-house there at Claiborne Hills Supermarket. My po'boy came dressed with just lettuce (I should have asked for tomato, but didn't think about it) but it was absolutely marvelous. We didn't even get out of the parking lot, just peeled back the wax paper and dined on sections in the car, getting lettuce everywhere but not caring a bit. I mentioned the olive salad and the po'boy loaf and the muffeletta loaves, right? 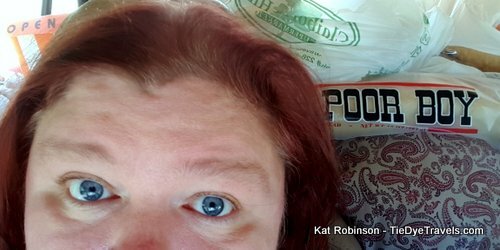 The latter are in my freezer, awaiting a glorious lunch in my near future. 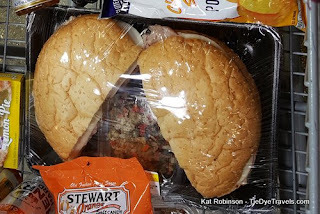 Since I can't have pork but wanted the big round sandwich, I acquired smoked turkey and blackened turkey and provolone and mozzarella here, and the day after we got home Grav assembled them with the olive salad on the po'boy loaf and ah. Ah yes. Sorry, I ate that, no photos left. Ten day trip. Packed car with two adults and all our junk. Of course I'd make room for this loaf. 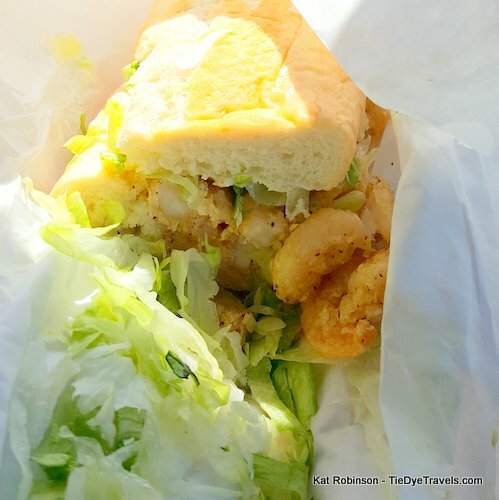 So when you're in the area, do check out the Lunch Box (which I will tell you about soon) but for seafood po'boys, go by Claiborne Hills Supermarket before you head out to the beach. Oh, that pizza was also fantastic. And did I mention they have Swamp Pop? 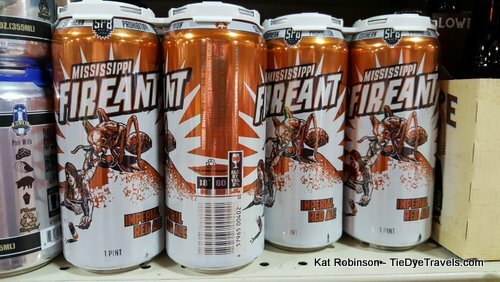 Claiborne Hills Supermarket also has a huge selection of alcoholic beverages and craft brewed beers - including this Mississippi Fireant. This particular brew's mere existence scares me. It was great to see Arkansas represented here with Mountain Valley Water! And then there was this... which Grav discovered. 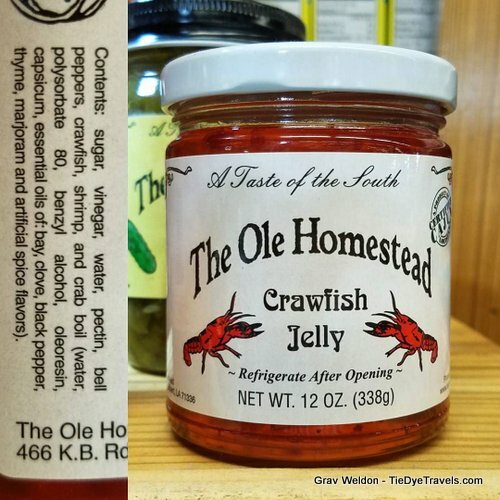 Crawfish Jelly, anyone?